Rocking Horse Vintage Classic Plush Stuffed Ride-on Toy Coffee Brown w/ Sound. A classic favourite. This Rocking Horse is soft, sturdy, and makes sounds. Classic Rocking Horse design. A new twist on a classic favorite. This Rocking Horse is soft, sturdy, and makes sounds. Features:● Classic Rocking Horse design. Specifications/Dimensions:● Colour: Brown. A new twist on a classic favorite. This Rocking Horse is soft, sturdy, and makes sounds. Features:● Classic Rocking Horse design. Specifications/Dimensions:● Colour: Pink & White. 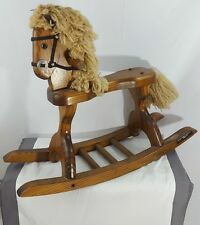 Vintage THE WONDER PONY Toy Spring Rocking Horse 1960's Nice. Condition is Used. Shipped with USPS Priority Mail. Signs of wear, still 100% functional. Beautiful Vintage Wooden Rocking Horse Klapat Textiles Inc.
A classic favourite. This Rocking Horse is soft, sturdy, and makes sounds. Classic Rocking Horse design. Colour: Light Pink & White. Overall: 28.7"L x 11.8"W x 27.6"H.
PonyCycle toy is an adorable, child sized ride on toy pony which relies on child power to move. Your little one will feel like riding a real pony, as a natural riding motion is required to get Pony moving. VINTAGE WOODEN ROCKING HORSE TOY MOVING TAIL & LEGS MAKES GALLOPING SOUND COOL! New PonyCycle Toy 3-5 Year Kids Ride on Unicorn Horse Small. PonyCycle toy is an adorable, child sized ride on toy pony which relies on child power to move. Your little one will feel like riding a real pony, as a natural riding motion is required to get Pony moving. A built-in footrest provides added stability and the saddle supports riders up to 66 lbs. Ages 3 and up. 27" H x 26 1/4" L x 22" W. (34 lbs.). Enchanted Electric Ride On Unicorn Toy Illuminating Horn Sound Effects. PonyCycle is based on the centuries old push-pull rod principle. It is the first simulated action animal toy in the world that allows kids to ride it. Kids can use their imaginations while developing their balancing ability and coordination, and getting beneficial exercise. Trademarked and patented, they are the original inventors of the world's first simulated ride-on toy. Their models are comfortable to ride, soft to touch, and easy to maneuver. IMAGINATION AND CREATIVITY PonyCycle focuses on encouraging exercise, imagination, and creativity. 31"x19 1/2"x 28" tall. See photos for conditions. Vintage Wonder Horse Wonder Pony Spring Rocking Horse.Disassembled for better shipping price. Plastic body measures approx; 25" long x 13" tall x 3" wide. Metal frame measures approx; 33.5" long x 17.5" wide x 16" tall x 1" diameter tubing. Light blue with pink saddle. Good condition with some surface wear (as seen in pictures). I will Pack with care...ship with Insurance and delivery confirmation for your protection THANK YOU FOR LOOKING. I AM SURE MANY OF YOU COLLECTORS OR DEALERS COULD USE A STIRRUP SO HERE IS YOUR CHANCE. IT'S A BEAUTIFUL EXAMPLE! Authentic Models Toy Wood Glider Rocking Horse. Coin in the photo is not included but is intended to give a visual aid as to size. Made of heavy cast iron and weighs almost 4 lbs. 7-1/2" tall x 9" long x 2-7/8" wide. Either way, a beautiful collectible. 1950s Vintage RICH TOYS ROCKING HORSE Small Scale Wood Plastic Rare. Condition is Used. Shipped with USPS Parcel Select Ground. Very collectible Blazon, Inc. Small Hobby Horse. Molded plastic horse with handles. Vintage DUKE HARRY Rocking Bucking Horse MADE BY TRAIN RITE Maple Plain Minn.